The life of Smurfs has been well observed so far in their own world, where they live in in mushroom-shaped houses in the forest. The reader finds good introductions in wikipedia and more specialized collections. The Common Smurf is well known as a cute, small creature, with completely smurf-blue skin color. However, the possibility to transform into other life forms has been insufficiently investigated for this species. This gap is to be filled by this publication. 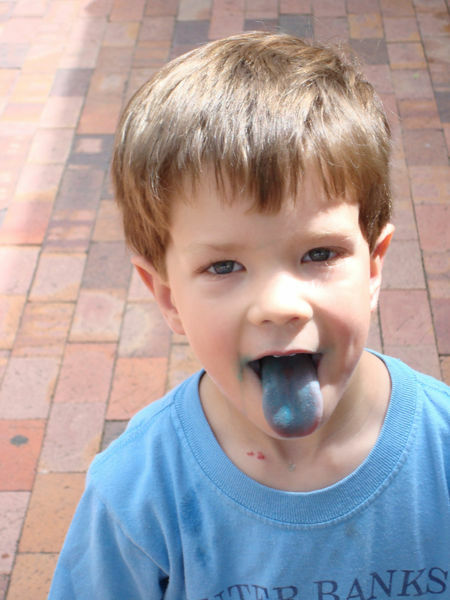 The Black Smurf is a minor transformation of the smurf-blue Smurf, featuring the same size and shape of the body. The skin however has turned into black, caused by a bite of the Black Fly. The transformation is know to cause severe personality disorders, where the Smurf loses the ability to articulate and shows anti-social behaviour, including biting common smurf-blue Smurfs, spreading the disease. This transformation is known to be reversible, and the details of the cure are recorded in wikipedia. The Little Blue Smurf must not be confused with the Common Smurf despite its misleading name. The Little Blue Smurf is a transformation of a Common Smurf into a humanoid form, where sizes up to 1.50 m body height have been observed. During the transformation, the Smurf loses its smurf-blue color, at least on the outer skin. During the transition, the color can sometimes still be seen inside, as depicted. In memory of their previous skin color, some cover their body with matching items of fabric. Although significantly larger than the Common Smurf, the Little Blue Smurf is still quite cute and adorable, and most individuals can be considered harmless. Despite their humanoid form, their knowledge about the world of humans is quite limited. Anyway, they attempt to adapt quickly and behave a lot like little children. The Great Smurfel is a transformation of the Little Blue Smurf, with its size still increasing, and the smurf-blue color having completely disappeared. In appearance, it is now very hard to distinguish them from juvenile and adult forms of homo sapiens. They are recognized mostly by showing smurfish behavior, and a reluctance to move fast. However they can develop good skills in some specialized forms of locomotion, such as horizontal swimming or vertical climbing. When compared to homo sapiens of the same size and apparent age, they show good intelligence. What makes them dangerous is their desire to increase their knowledge, some individuals have even been observed reading books. Their smurfism is known to be highly contagious and can infect regular homo sapiens, so extreme care is necessary to avoid infection.